He's obviously addressing Christians by His first sentence. Why would He list "suffering", "affliction" and "tribulation", "calamity" and "distress", "hunger" and "destitution" if these things were not going to be part of the Christian life? Healthy brethren with their worldly needs met amply would do well to read this verse and consider it before telling less blessed brethren that it's their own fault because they don't have enough "faith". That's a pretty arrogant and mean spirited attitude for ones professing to be followers of the Christ and who have nothing of their own to brag about, but owe all to Him. 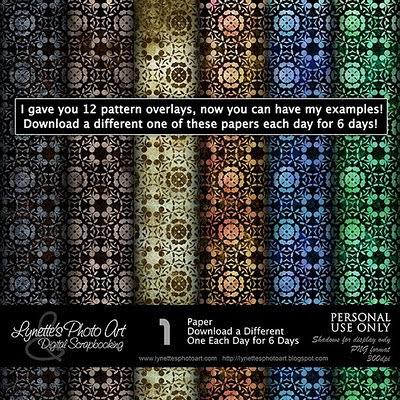 Now for today's gift - I have just given you 12 different pattered overlays to make papers with. I thought you might also like my example papers, so I'll be giving you one of my preview papers each day till you have all 6. Enjoy! Thank you! This blog post will be advertised on CraftCrave in the DigiFree category today (look for timestamp: [22 Feb 01:00pm GMT]).